Some boats use tiller steering while others use wheel steering. Both have advantages and disadvantages to be considered. Special techniques are used to steer tiller boats under sail. The type of steering on sailing vessels is mostly governed by boat length and weight. 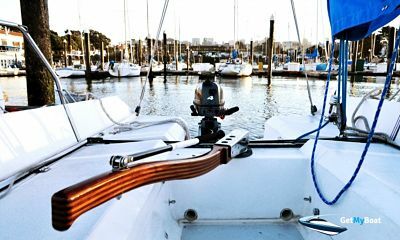 Many variables are considered when boats are designed, and the type of steering chosen on a particular boat provides the optimum control and convenience for the boat’s length and weight. A tiller is essentially a pole attached to the top of a rudder, It acts as a lever to directly pull or push the rudder. The rudder is a vertical, underwater blade positioned at the vessel’s stern, which can be moved to the left or right by the tiller. The rudder steers by redirecting water past the hull, creating turning motions for course changes. On most boats, rudders are positioned more or less perpendicular to the hull's longitudinal axis, which effectively brakes the vessel when pushed "hard over" by the tiller. The tiller and the rudder work together to steer by redirecting water past the hull, creating turning motions for course changes. Beginning in the Middle Ages, tillers on larger ships were replaced by cables, ropes, or chains that connected a steering wheel to the rudder, allowing greater rudder control with far less effort. With the advent of steam engines, metal gears replaced cables and ropes. Today, some large ocean racing sailboats use tillers, which afford an unparalleled direct steering feel. Though simple to operate, tillers provide only a limited amount of leverage and mechanical advantage. Leverage and mechanical advantage amplify the helmsman’s use of strength and force, which makes sailing easier and far less tiring. On boats of any size, operating a tiller can be fatiguing, particularly in heavy seas. Without a steady grip on the tiller, it can jump out of the helmsman’s hand and deliver a painful blow to the gut or legs. An untended tiller can produce immediate — and usually radical — turning motions, causing a potentially unsafe situation for the crew and nearby vessels. An autopilot, lock, or shock cord will control tiller movement. Larger tiller boats are typically helmed while standing, which enhances visibility but creates the need to constantly balance the body. During long voyages this can be physically and mentally draining. Provides an almost immediate rudder response for safer and higher performance, particularly in close quarters. For experienced sailors (especially single-handed), a tiller allows multi-tasking while helming; the tiller can be moved with the legs, leaving the hands free to trim sails, eat, drink, etc. Many tillers fold out of the way when not needed, creating more cockpit space for easier access to winches, cleats, and other important parts of the boat. An experienced helmsman can feel if sails need trimming by the level of steering effort; also, water friction flowing around the rudder generates a feel used to make tiller adjustments. If desired, autopilots are generally less expensive and easier to install. Steering with a tiller takes a lot of practice, especially because the tiller is moved in the direction opposite from the desired heading, exactly the reverse of steering wheel operation. The tiller is always moved in the direction opposite from which the bow is to move: if the tiller is moved to port (left) side, the bow turns to starboard (right); if positioned to starboard, the bow turns to port. Tiller sailors are taught the saying tiller towards trouble, reminding them to push or pull the tiller towards (not away from) another boat, navigational aid, course mark, shore feature, or other potential danger that must be avoided. The saying (and its meaning) is counter-intuitive, but accounts for the fact that a tiller positioned in either direction except dead ahead will move the boat opposite the direction it is pushed. For novice sailors, learning how to steer with a tiller can be a challenge. The best advice is to learn from an experienced helmsman in underway situations when tiller position and speed are critical, such as in heavy weather or when docking. The ancient technique of sculling is often used on tiller boats during close-quarters maneuvering, like docking. Sculling creates drag and turns the rudder into a “steering oar” of sorts, producing forward-thrust, side-to-side movements while changing the blade angle. Sculling takes practice to generate the desired amount of speed and direction, particularly near docks or mooring/anchoring points. Some sailors feel that a shiny, prominent steering wheel in the cockpit is much more nautical-looking than the tiller, but tillers do have their place, particularly on smaller sailing vessels. Sailing a tillered boat takes some practice to do so safely and efficiently, and boaters should always keep in mind, and practice, tiller towards trouble.